A perfect storm is brewing this summer for emerging markets, and it could hit hard in September. After years of impressive growth, countries like China and Brazil face steeper challenges this year, World Bank President Jim Yong Kim said in a report released Wednesday. "Developing countries were an engine of global growth following the financial crisis," Kim said. "Now they face a more difficult economic environment." The World Bank isn't the only organization expressing concern. The Federal Reserve debated the negative affect of a Fed rate hike on emerging markets at its last meeting. Concern is rising. 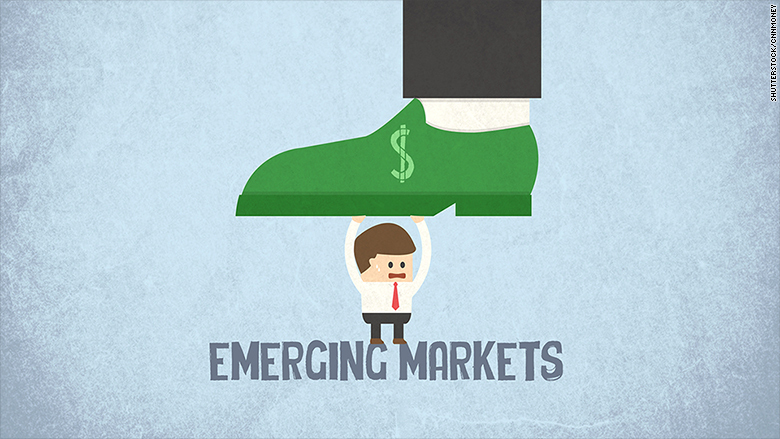 Three things could culminate in September to send investors scrambling from emerging markets. 3. A Federal Reserve rate increase. Issues with a Fed rate hike: Many experts expect the Fed to raise rates in September, something it hasn't done since 2006. That would cause two things. It would increase borrowing costs -- interest on loans -- for companies in emerging markets. And it would make American debt more attractive to investors, meaning emerging market debt could see a selloff. Anytime the Fed moves an inch, it makes emerging markets shiver in fear. In 2013, when former Fed Chair Ben Bernanke signaled that the bank would eventually end its stimulus program, emerging markets had a "taper tantrum." So a Fed rate hike isn't welcome news. Storm clouds ahead: The rocky outlook for emerging markets this year is a far cry from just a few years ago when the U.S. dollar was weak, interest rates were near zero and commodity prices were still high. "All that was a perfect storm for emerging markets to perform well. But that rug has been pulled out," says Win Thin, global head of emerging market currency strategy at Brown Brothers Harriman. "I'm pretty nervous for emerging markets this year." Not all emerging markets will struggle, Thin says. Countries like India, China and Colombia are better positioned than Brazil and South Africa. Generally, Asian countries are expected to fare better than Latin American and African nations. Related: Emerging market stocks are surging: is it triumph or trickery? The dollar's surge, like rising interest rates, makes it harder for emerging nations and businesses to pay off their debt. And emerging economies' engine of growth -- commodities like oil, copper and soy -- have fallen off a cliff in the past year. It's a triple whammy. Earlier this spring, emerging market stocks, which are cheap, were surging, up 10% in late April. But that was just their moment in the sun. Reality is starting to set in that a Fed rate hike is coming. (Fed Chair Janet Yellen basically said so in May.) The MSCI emerging market index is now only up 2.2% this year. The major concern is that all these factors could cause cash to flood out of emerging markets and companies this fall. "The U.S. Federal Reserve's first interest rate increase since the global financial crisis could ignite market volatility and reduce capital flows to emerging markets," the World Bank said in its report. Kim, the bank's president, said it will try to help these countries.